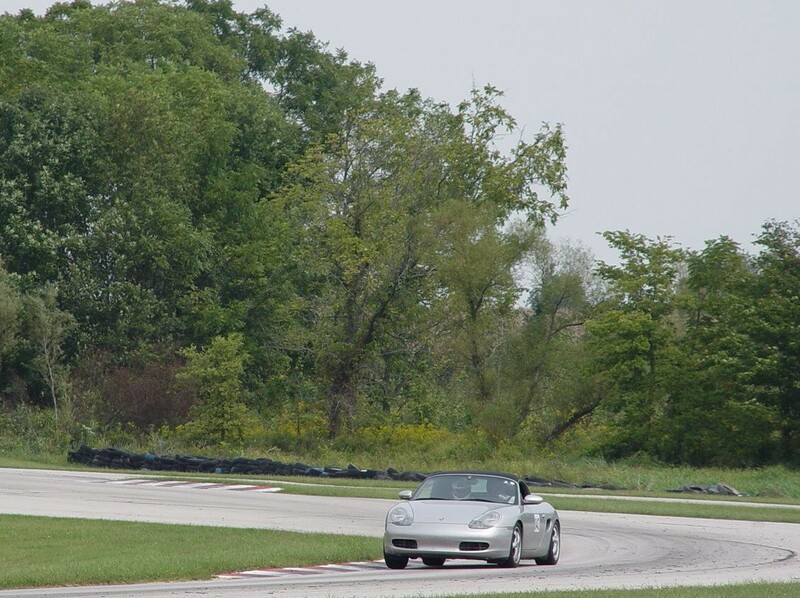 For the third time this year, I visited Putnam Park for Porsche Driver Education weekend. This event was hosted by the Central Indiana Region, and thought they did a better job than the Kentucky Region and Mid-Ohio Region (but all were great). I was surprised how long it took me to get back to the performance level I obtained during my previous weekend. I feel like I was slower the entire first day this session, but reached and maybe exceeded my previous levels on the second day. I don’t have a lap timer (yet) so I’m not really sure how I was doing, but it’s easy to tell when the tires are approaching their limit (or not, as was the case Saturday, because I was slower). I did have several new experiences this weekend. I actually pushed the car hard enough to unsettle it a few times. (Click the image to enlarge for traces of wrong routes). The first “experience” in the very tight and very slow Turn 7, where I decided I could take the turn a little faster than I really could. The back end started to come around mid-turn but I was already back in the throttle, which started the transfer of weight to the back end. My mistake turned into a pretty nifty rear end drift, with the rear neatly tucking back in as I straightened the wheel. I’m sure I was slower through the corner and I’d never intentionally do it again, but it was fun in retrospect. And I learned something new about the car’s handling. The second “experience” occurred in Turn 2, which is one of the fastest turns on the track. It was my first session on Sunday morning. I was trying to carry more speed into the corner and was doing better each time. Until I decided to take the turn waaay too early — which means there was no way I could stay on the track because I was going too fast and point the wrong direction. So I said out loud “I’m going off the track”, I pointed my wheels straight forward, and about 1 second later I was coasting through the grass. It was a very boring exit, the car was never in any jeopardy — my pulse didn’t raise at all. I was glad that I recognized I was on the wrong line and chose the best escape. The “guest instructor” riding with me said that if I had tried to save it, I probably would have spun. I didn’t even consider trying to save it and was pleased with my composure. My forth “experience” was with my new Mintex “red box” brake pads. I was going out for my 4th and final Sunday session and heard a little grinding in the front when I hit the brakes in the parking lot. So I skipped the track and when in to check the front brakes. The and front left pad was completely consumed. Now, I’d checked the pads Saturday morning, Saturday afternoon, and Sunday morning and there was plenty of material left. But my three sessions on Sunday (and my increased speed) finished them off. Wear issues aside, I must elaborate on how terrible these pads were. They had no initial bite and required long, excessive pedal application to slow the car down, which causes more heat in the pads and more into the brake fluid. These pads were far inferior to the stock pads for both initial bite and maximum stopping force, when they were cold and at higher temperatures. And they didn’t even last 2 DE weekends. These pads were terrible and I’ll never, ever use Mintex pads again. I had a great weekend and was happy with my driving by the end of Sunday. More importantly, I learned a bunch about how my car reacts to different situations and how to compensate for mistakes. The only downside is that, for the first time, I noticed my 2.5L engine’s lack of power. I could drive faster than several (but not all) of the more-powerful cars in my C group as long as we were in the curves. But as soon as we made it to a straight-away, I’d start losing ground. I could sometimes catch back up for a little while (as long as we were between turns 1 and 7), but I was incapable of making up any distance throughout the other half of the track. I knew it would happen eventually, but I didn’t think it would be this soon. But I’m not ready to purchase a more powerful car. Yet.